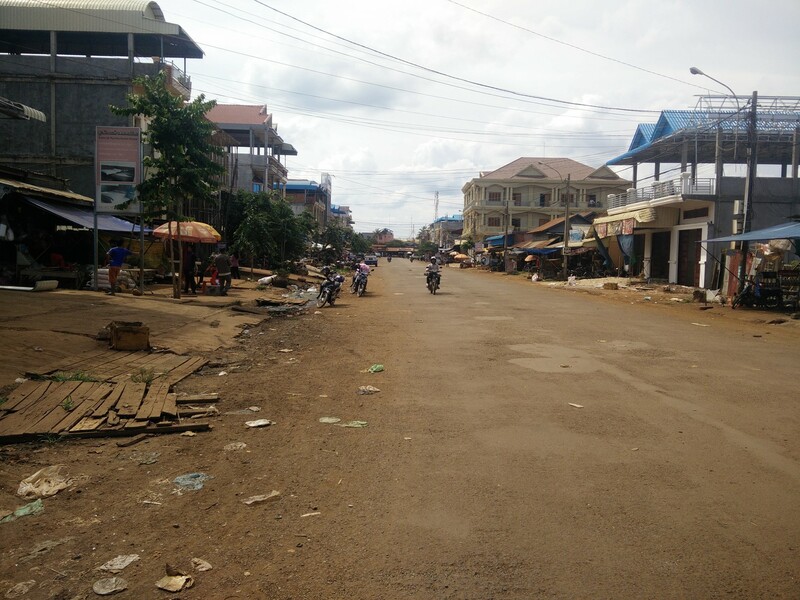 After crossing the border to Cambodia by bus the first town we encountered was Ban Lung. Although similar in many ways, once you look closer there are many differences between this town and the similar town of Pleiku in Vietnam on the other side. Ban Lung is a fairly remote “genuine” Cambodian town about 1 hour from a small remote border. Of course, cities like Siem Reap and Phnom Penh are significantly different but I think it’s fair to compare Ban Lung (Cambodia) with Pleiku (Vietnam). First of all, in Ban Lung, there are more cars and less motorbikes and the motorbikes are older. My pointed out that the motorbikes they drive here are like the motorbikes in Vietnam 10 years ago. And unlike Vietnam, almost no one wears helmets. The second thing you notice are the streets. They seem dustier, more “sad” – in lack of a better word. The houses are of poorer quality and more spread out. Why are there so many pharmacies!? Now, when you take a closer look at the streets you’ll see that for this town particularly there is an abundance of pharmacies and moneychangers. My initial guess was that drugs are cheaper or more accessible here so many Vietnamese cross the border for this very reason – this would explain the moneychangers – this is a border town after all. Another theory is that since this used to be a French colony they adopted the French style pharmacies where they double as convenience stores selling shampoo and snacks and things like that. Contrary to Denmark, for example, where they only sell drugs and medicine. To me, it still doesn’t justify that literally every third shop was a pharmacy – and by far it hasn’t been as striking in other Cambodian cities as it was here. Please comment if you have a theory or better yet, know! That air-conditioner you’d gotten used to in Vietnam – not in Cambodia. All over Vietnam, even in the cheapest places you’d get air-condition. It usually wasn’t really an option to go for a fan-only room. In Cambodia, however, the default is fan-only. You can get air-condition in Cambodia but it’ll usually cost you $4-5 which is a lot when a room is $6. Alright, after a while you get used to the heat and air-condition isn’t really that important but the point here is that it’s a symptom of the general state of the room. Many cheaper places don’t have hot water, the rooms are smaller and simpler, and bugs crawling around is a thing you’ll have to accept. So in this sense, Cambodia is cheaper because there are cheaper options but if you compare two similar quality rooms – Vietnam comes out cheaper I’d say. There are of course exceptions to this as I just made a very broad generalization. Oh yeah, this goes for food as well. Cheaper but grimier solutions in Cambodia. Walking around town we had trouble finding a place that looked clean enough that we wanted to eat there. Otherwise, it’s pretty much the same isn’t it? There is one last thing worth mentioning which is significantly different. The money. Although Cambodia has a local currency, Riel (4000Riel = 1$USD), Cambodia runs on US dollars. Everything is given in dollars except for marketplaces and very local spots. It’s also used for small prices as 4000Riel to 1$ makes it a lot more granular. They even have a 100Riel note (0.025$). All over South East Asia you will see many prices given in dollars and especially if you go to places with tourists but this is different. Here, even the ATMs give dollars. You can find ATMs giving local currency but they are rare and only accept local cards. I have yet to find a place where they don’t accept cool dollars. So you wouldn’t really need the local currency at all if it wasn’t for the fact that dollars are likely to be rejected if they are not in close to mint condition while riel you can chew up and spit out again and they still work. For those often changed cash, riel is better. A funny anecdote is from the first time I tried to get cash from an ATM. I put my card in the machine and it asked me how much I wanted (without options as there usually are or the currency expected) so I clicked 800000 ($200) and pressed accept. It didn’t work. It now told me it had to be a number you could get with 35 notes. Great! Could you now please tell me what notes you offer, dear machine. I tried a little lower, 350000, guessing the machine had 10000 riel notes. At that point I gave up and thought it was just the ATM that didn’t work. Later, I found out that they run on dollars and by pressing 200 on the machine I got 2 100$ bills. Apparently it means that it runs on $100 bills – just like the machines in Las Vegas. Also worth noting is that although I didn’t test this out, in theory, with 35 notes you can get $3500 – quite a significant amount!